Hello and a Happy Friday to everyone! Today I'm sharing a card I made using the Christmas Ornament Die from Cheapo Dies. I'll be here every Friday to share a new die with you so I hope to see you again. 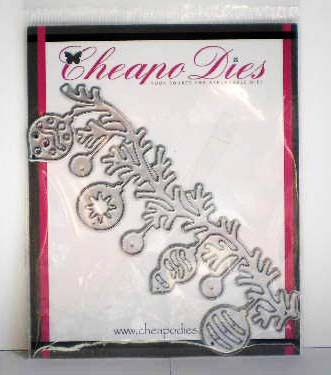 In the meantime, be sure to take time to check out all the different dies they have available. You can see them HERE. To a white card base, I added a layer of patterned paper in green then, added a strip of coordinating patterned paper from the same pack. 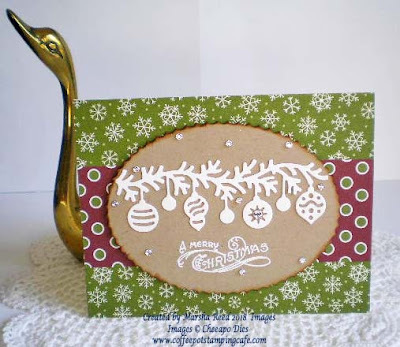 The Crumb Cake oval was one I had in my stash and it shows off the Christmas Ornament die-cut perfectly. I added Clear Wink of Stella to each of the ornaments to give them a wee bit of sparkle. Of course, you can't see it in the photo, but it is there.